The benefits listed below make it easy to achieve significant cost reductions and quality improvements. We know for a fact that some of our customers have even achieved savings approaching 50%. The key to success is to redefine what it means for a piece of software to be "done". Meeting functional requirements alone is not enough. The enforcement of quality standards and architectural rules is mandatory for sustainable and efficient software development. Our tools allow you to do just that in a simple and effective way. Industry research has revealed how technical debt harms the quality and maintainability of software systems. And technical debt can increase every day as developers introduce architectural flaws and code quality issues into the code base, either unintentionally or through neglect of proper coding and design rules. All this means that the cost of change will grow much faster than your code base. Architectural debt is a particularly toxic form of technical debt: while many technical debt issues can be fixed relatively easily with a local change, it is much harder to fix architectural issues once they have grown over a certain limit. Fixing them requires risky large-scale refactoring, a lot of time, and appropriate tool support. "Knowing is half the battle"
The first step is always to make an honest assessment about the level of existing technical and architectural debt. The next logical step is to develop a plan to eliminate the most critical issues while also avoiding the creation of new issues. Our products integrate nicely into your existing development environment, and help you with this process. You would first define an architectural blueprint for your system. Having that allows our tools to warn developers immediately if they create an unwanted dependency that would violate the blueprint. Additionally you would define a quality model that defines rules based on metrics and other criteria. Again developers will receive immediate feeback about rule violations so that they can fix issues while it is still easy to do. Track key metrics over time and make your project's technical quality transparent. Trend charts tell you whether things are changing for the better or for the worse, so you can take action before things get out of control. You are not flying blind anymore. Integrate our tools into your software development process, and your team will spend less time fixing problems rooted in technical and architectural debt. They will have more time to focus on the business value of your system which means that they will be more productive. More productivity means more agility, which is crucial for keeping an edge in a rapidly changing technological environment. Several of our customers were able to reduce their defect rates by a factor of ten compared to similar projects they undertook without our automated architecture and quality rule enforcement. When the quality model and the architecture are defined formally, it becomes easier to transfer knowledge and hand over responsibility for the system from one team to another. A code base without architectural flaws makes it much easier to extend the lifetime of a system so that it can make the money back that has been invested into it. Our tools make it increasingly difficult not to achieve exceptional results! You realize that obtaining long term benefits means redefining what it means for a software system to be "done". Code should not just provide the desired functionality, but should conform to a set of architectural and quality rules. And no software system should go into production unless it meets your standards for quality. Solid craftsmanship requires the right tools. Sonargraph-Explorer is ideal for code comprehension, quality assessments and reverse engineering of complex code bases. Sonargraph-Architect empowers teams to build better software by making it easy to adhere to an architectural blueprint and metrics based quality rules. 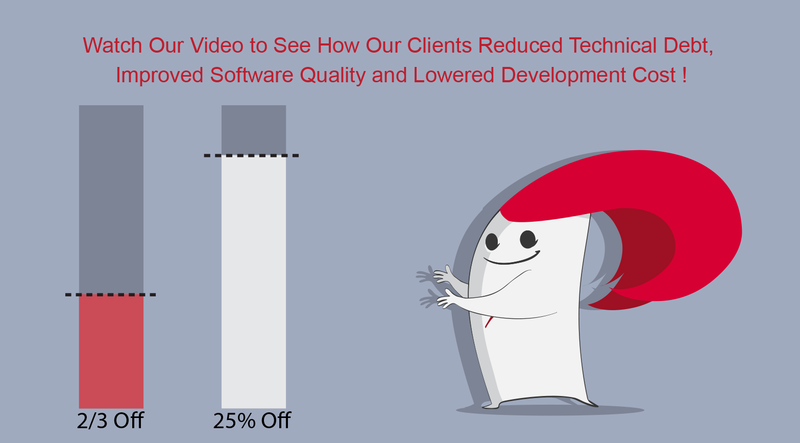 Your software can grow without the usual build up of architectural and technical debt. Let our tools help you! Get an entertaining short video introduction that explains how your company would benefit from using Sonargraph. Click to view our video introduction">. Try our tools on one of your project. Evaluations are free and without obligation. Get registered or login to be able to download our products and request evalution licenses.